This is my Studio. It was rebuilt in 2014 to what it is now. 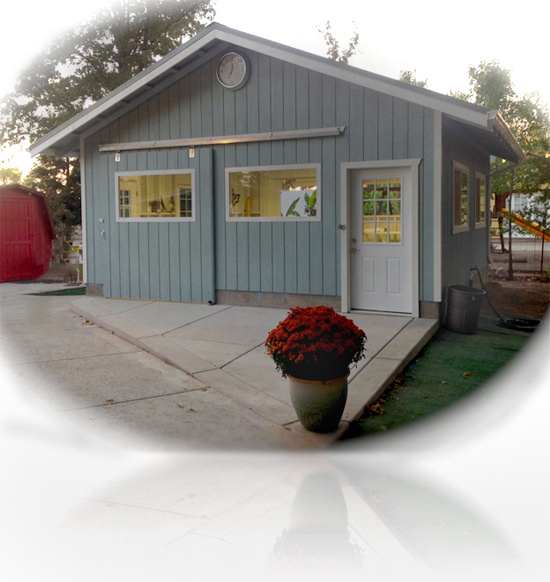 After the rebuilding we renamed it the Skookum Studio. Skookum: It has a range of positive meanings. The word can mean 'good,' 'strong, 'best,' 'powerful,' 'ultimate,' or 'brave.' Something can be skookum meaning 'really good' or 'right on! 'excellent! ', or it can be skookum meaning 'tough' or 'durable.' A skookum burger is either a big or a really tasty hamburger, or both. This is called a pug mill. It's a Peter Pugger VPM-20. This bad boy mixes and extrudes clay. I can use pure clay powders or raw clays I can find in the wilderness to formulate clay bodies. Not only does it mix clay it also has a vacuum system to "de-gas" the clay. 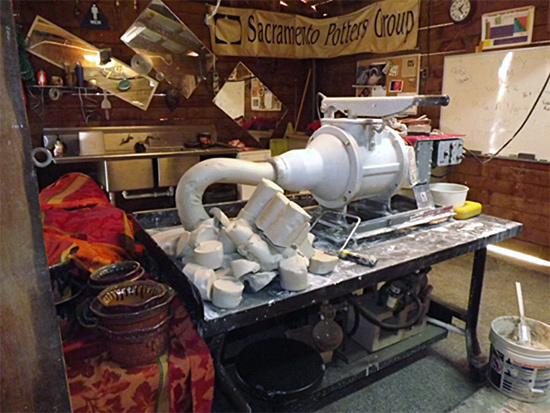 Then once the clay is mixed, warmed, and degassed it will extrude as a endless, log, or using dies it can extrude shapes like handles or ropes. This machine can make a old potter feel young again. 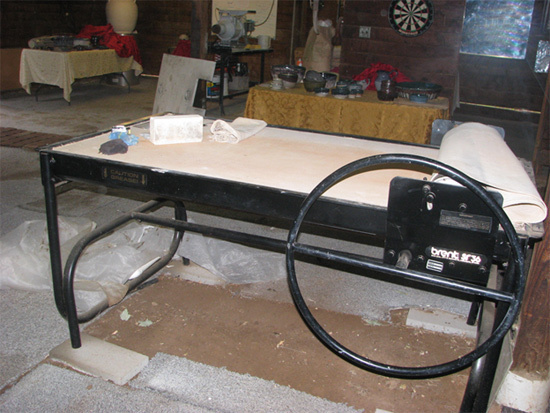 Yes, I have a slab roller. It's a Brent 36" and is about the best you can buy. What it does is simply roll out clay into a "sheet." Then, once you have a sheet or slab of clay, you can build with it like a sheet of cloth. I love to teach when I have the time. A couple of dozen brand new cups. 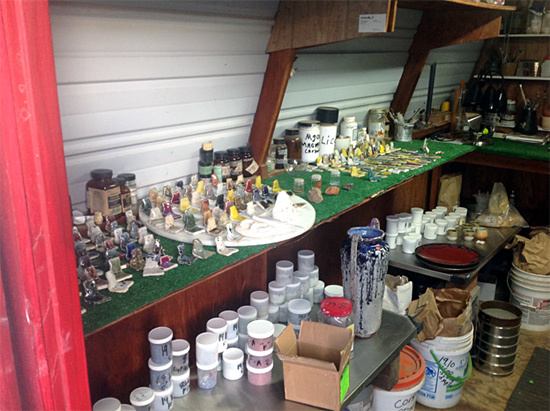 A quick peek into my glazing laboratory. 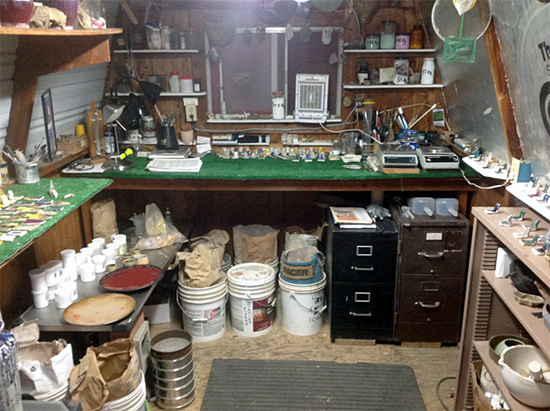 This is where I formulate my glazes. 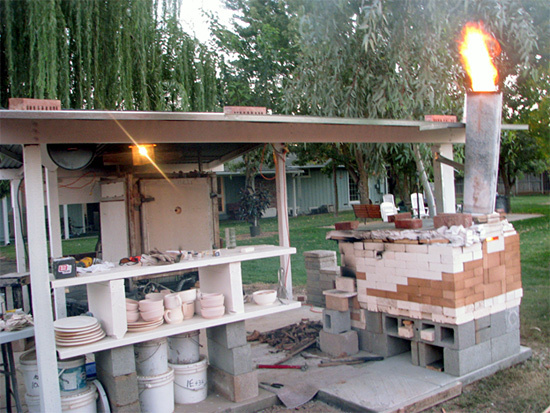 This is the kiln I designed and built in 1988 when I was only 28 years old. It is 30 cubic foot. This is the heart of any pottery. 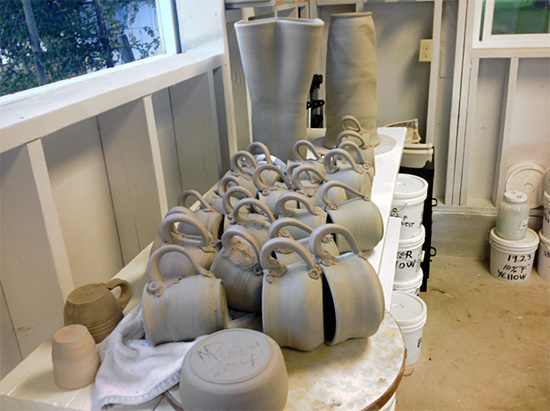 Without a kiln you can never convert clay into ceramic. That transformation starts at about 1050° F. People ask me, "Why can't a person use an oven to make pots?" I tell them a kitchen oven will not get hot enough! My pots are heated to 2300° F. Don't try that at home in your kitchen! This is one of my newest, "old" kiln, it's only 10 cubic feet. I think it's over 50 years old. It was only used by a little old lady in Pasadena, Ca. When I received it, the whole burner system was completely wrong and it would never get to high temperatures. So I just reengineered the whole combustion system. I even added a blower system fashioned from a bathroom attic fan, ducting, and some beer cans. 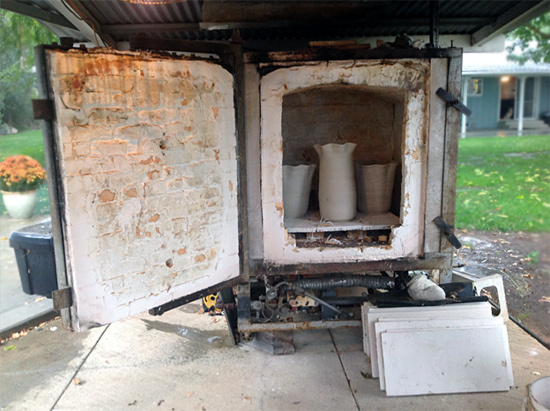 This is my wood kiln. 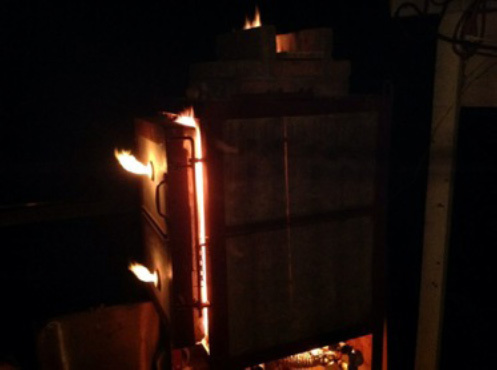 To be more specific it's a hybrid wood/propane kiln. As a matter of fact, it's a cross draft, down draft wood/propane cone 10 kiln. Yes, I built it over a two weekend period off the top of my head no drawings until I finished it. I had to put drawing into my laboratory notebook. 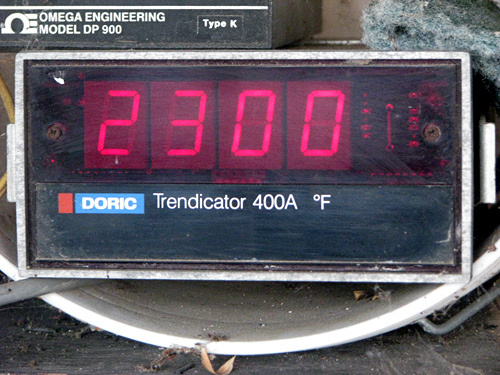 This is called a pyrometer. It can read temperatures just a little higher than this, but not much. 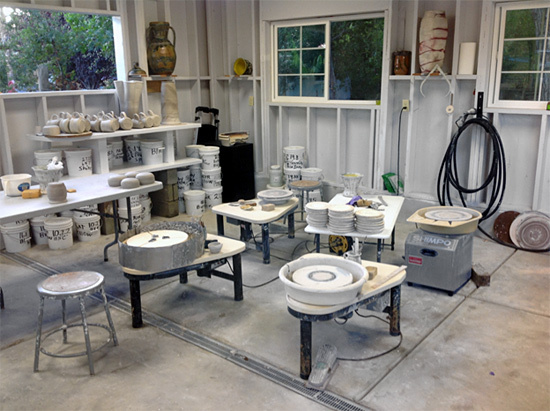 One more picture of my glazing laboratory. I usually first formulate and dispense only a five gram glaze sample using a test tube. That will give me just enough glaze to make one of those colored chips you see on the shelf. If I like the formulation after it's fired, I will scale it up to two kilograms. That will produce about 1½ gallons of glaze.